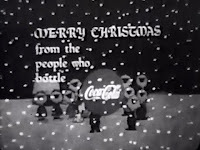 A popular bit of trivia about the classic television special A Charlie Brown Christmas is that when the special first aired in 1965, it included - as part of the show's animation - two spots promoting the show's sponsor, Coca-Cola. 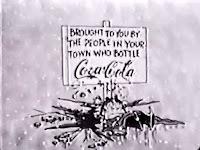 And at the end of the show, the closing carol originally included the complete verse (instead of fading out) with a final on-screen "Merry Christmas from the people who bottle Coca-Cola" right after the United Feature Syndicate credit. These sponsorship spots were edited out of subsequent broadcasts and home video releases, because understandably, later sponsors (and the companies releasing the videos) didn't want to advertise someone else's product. So, the two Coca-Cola bits have remained mostly unseen since 1965 (although Coke also sponsored the 1966 broadcast, so it's possible they also aired that year.) Even though they were extremely brief and not integral to the special at all, many Peanuts fans have wondered where they can see them. I've been told that the Paley Center (formerly the Museum of Television and Radio) in Los Angeles and New York has a copy of the original, unedited broadcast that you can view when you visit their collection, but I haven't personally verified this (and their policy is that they do not make copies of any shows, for anyone). The producers of the behind-the-scenes featurette on the Warner Home Video DVD and Blu-ray release of A Charlie Brown Christmas attempted to find copies of the Coke spots that they could use, but were unsuccessful. The interest in these spots is so great that, unfortunately, a couple of misconceptions about them have arisen and been repeated on many sites across the Internet. Misconception #1: The ending sponsorship spot was only a voiceover. 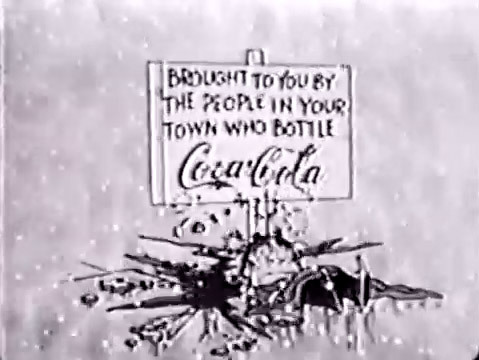 Perhaps it was changed to a voiceover later on, or in certain markets, but as the video linked to above shows, the original broadcast displayed the words and Coca-Cola logo on-screen without a voiceover. Misconception #2: In the scene where the gang throws snowballs at a can on a fence, it was a Coca-Cola can in the original broadcast, which has since been replaced by a generic can. This is false. The can has always been a generic can, even in the original broadcast. (The source for this information is a personal interview with Lee Mendelson.) 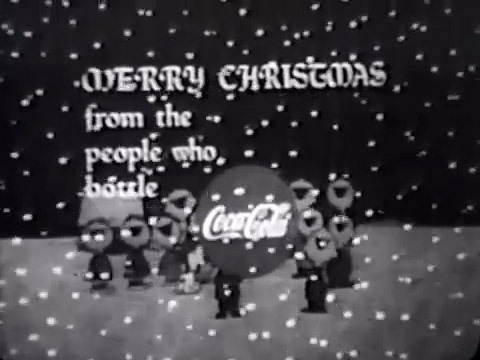 This so-called "fact" probably arose as a conflation of the removal of the two actual Coca-Cola spots, and the edits that CBS made when broadcasting A Charlie Brown Christmas in the 1990s in order to make room for extra commercials - the throwing snowballs at a can scene was one of the removed scenes. Fortunately, these days A Charlie Brown Christmas is always broadcast unedited at least once a year, and all home video releases from Paramount and Warner Home Video are also unedited - except for the very brief Coca-Cola sponsorship spots that we can now see on YouTube thanks to an enterprising fan. Don't forget that ABC will broadcast Happy New Year, Charlie Brown on Thursday, December 27, 2012 from 8 - 9 PM (Eastern/Pacific). It will be accompanied as usual by a shortened version of She's a Good Skate, Charlie Brown. This will be the special's only broadcast this year, but you should be able to find it on hulu.com and ABC.com after it airs. There's plenty of opportunities to see the Peanuts gang on television this week, December 17-21, 2012! First, you'll have a second chance to see A Charlie Brown Christmas and Happiness is a Warm Blanket, Charlie Brown; then it's this year's only outing for I Want a Dog for Christmas, Charlie Brown.